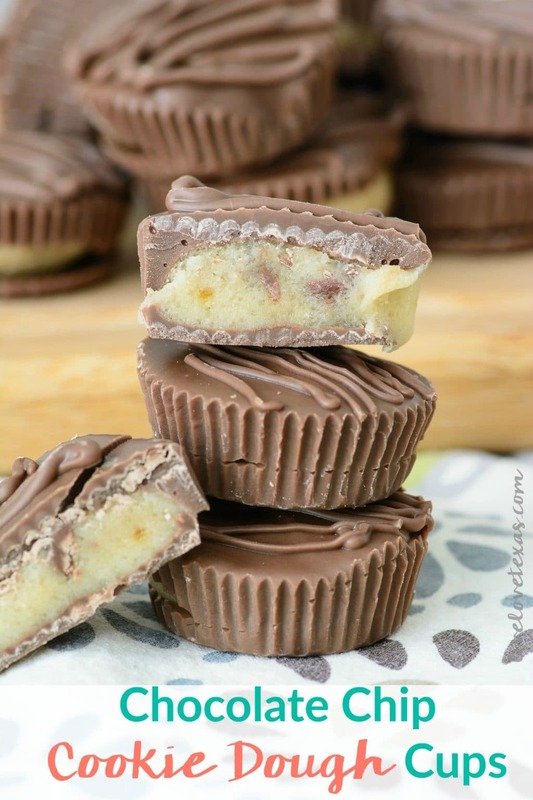 This Cookie Dough Cups recipe combines your favorite guilty pleasure…chocolate chip cookie dough hidden inside one of your favorite candies. But this no-bake, edible chocolate chip cookie dough is completely safe to eat and will undoubtedly melt in your mouth. I have a slight serious addiction to cookie dough. As a teenager my grandma would buy those giant tubs of chocolate chip cookie dough from Sam’s and instead of making cookies, I’d just grab a spoon and dig in. It was my guilty pleasure (and still is) even with the possibility of salmonella. But why risk it when you can make edible cookie dough?! How do you make cookie dough safe to eat? Who knew it was so easy to even make edible cookie dough? Obviously, it’s the raw eggs that do you in with regular cookie dough, but by adding some extra butter you get the best edible cookie dough recipe. Yup, you just need to use 2 sticks of butter and keep the eggs out. What you have left is a cookie dough recipe that is safe to eat. Definitely not the healthiest thing in the world…but safe to eat anyways. 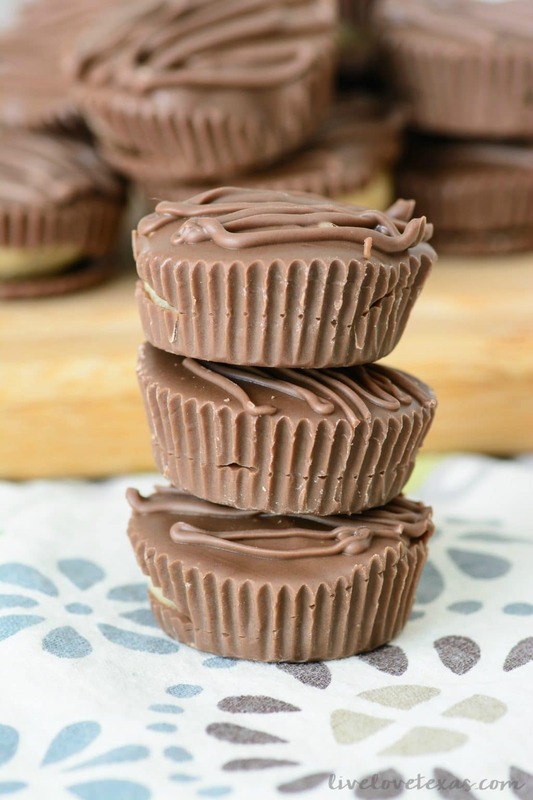 Then to take things a step a further, you dip transform your edible cookie dough into chocolate chip cookie dough cups by using some melting chocolates. Super simple and no bake! Win-win! Melting chocolates are perfect for this. They have a perfect consistency and harden up pretty quickly in the refrigerator. Here is what you will need from the store to make your own cookie dough cups. Here is a printable recipe card with my cookie dough cups recipe. You can even just make the edible chocolate chip cookie dough, if you want! Don’t forget to pin this post so you can find it again later. Mix flour and salt in a small bowl and set aside. Cream together butter and sugars in a medium bowl. Add vanilla and water to the sugar and butter and mix on medium speed. Slowly add flour while mixing on medium speed until completely incorporated. Fold in chocolate chips until combined. Form into one inch balls, or use a cookie scoop, and press slightly flat with the palm of your hand, set aside. Melt chocolate in the microwave for 60 seconds on 50% power and stir. Continue melting in 30 second increments until completely melted. Line a mini muffin tin with liners. Fill liners 1/4 with melted chocolate. 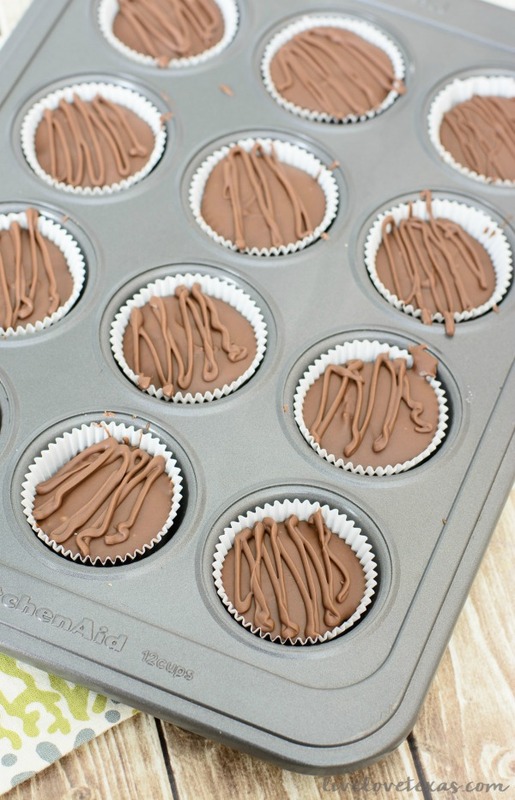 Place prepared cookie dough balls in the muffin tin and cover completely with chocolate. 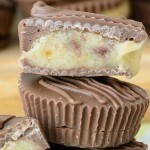 I personally adore edible chocolate chip cookie dough inside milk chocolate cups. To me, these are perfect. But it’s fun to try new things, so here are some fun recipe variations you can try. Instead of using chocolate chips and milk chocolate for the cups, use almond bark to coat the cookie dough. If you really love sweet things, you’ll enjoy how sweet the white chocolate makes the cookie cups. 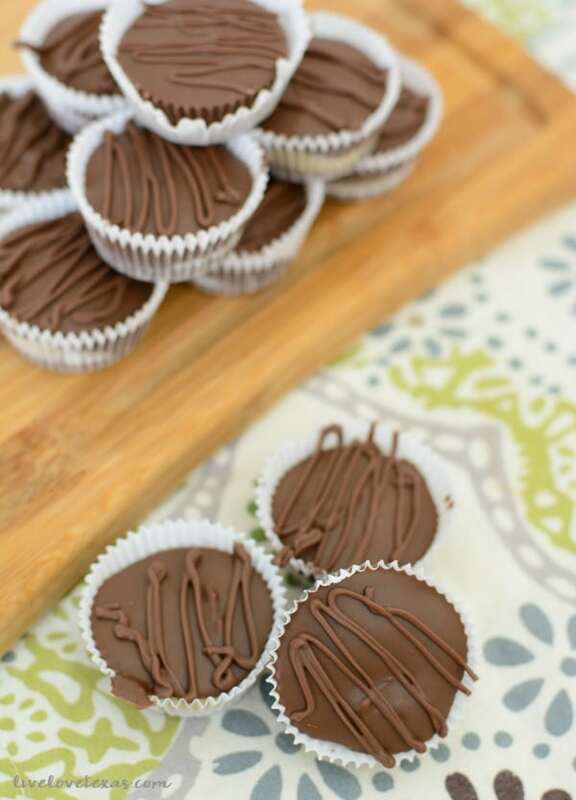 Instead of drizzling chocolate on top of the cookie cups, use a caramel sauce and sprinkle with sea salt. The salt will enhance the flavor of the entire cookie cup. Instead of using milk chocolate chips in the cookie dough, use butterscotch chips. This tiny change will create an entirely different flavor profile. Have you tried making your own edible cookie dough before? If you’re in the mood for some other cookies, check out these other delicious recipes! 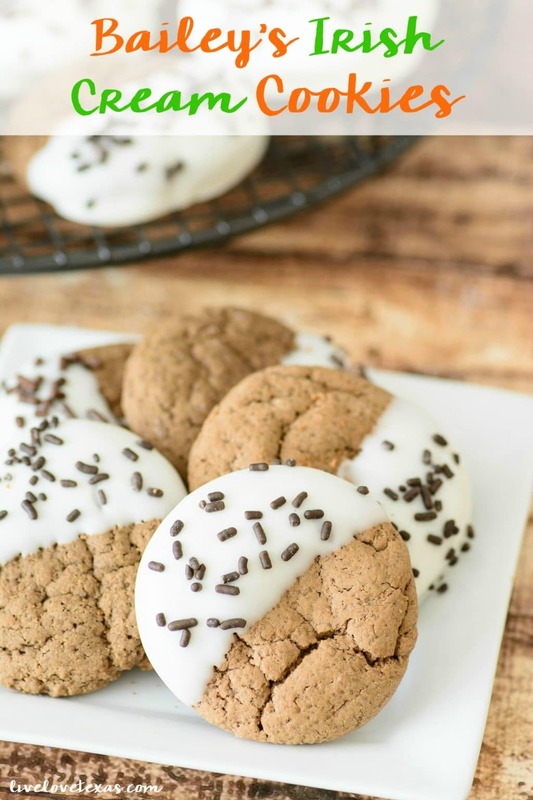 Bailey’s Irish Cream Cookies – Even though they are perfect for St. Patrick’s Day, you can make them year-round too. 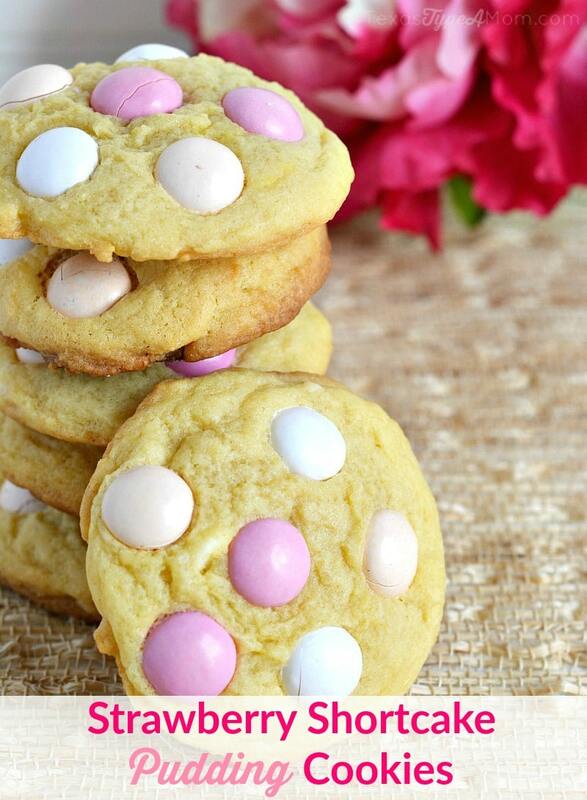 Strawberry Shortcake Pudding Cookies – They are the perfect color for Valentine’s Day. For even more amazing recipes, follow my Best Cookie Recipes board on Pinterest! Follow Kelly | Live Love Texas’s board Best Cookie Recipes on Pinterest.